Pull up, learn and explore with LeapFrog Learning Table with musical activities that teaches while baby plays. What is it? Turn musical activities into learning discoveries with this activity table. Learn mode introduces letters, numbers, shapes, colors, instrument sounds and more! 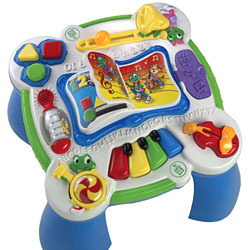 Flip the center page to Music mode and baby can make music, play songs, and hear instrument sounds. How does it work? This item features over 40 songs and melodies, and sparkling lights. It helps develop motor skills with lots of fun things to spin, roll, slide push, open and close. The table legs detach so infants can play on the floor. Contoured grips make pulling up easy for toddlers. This Learning Table from Leapfrog helps develop alphabet, counting 1 to 10, instrument sounds, colors, shapes, learning songs and cause and effect skills.